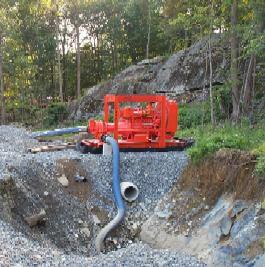 Two Godwin HL160M high head Dri-Prime pumps are supplying water for the irrigation system at a new golf course under construction at a resort in Connecticut. The first pump pulls water from a containment tank at the resort's water treatment plant to feed the second pump 6,000 feet away at a 165-foot elevation. The second pump boosts the water to an irrigation system throughout the new course. The furthest irrigation heads are located 3,000 feet from this pump at a 100-foot elevation and require 80 psi. The system was designed as a totally automatic operating system. The booster pump on the course starts when the pressure drops below 80 psi as the first sprinklers come on. This causes a drop in pressure in the suction line which starts the feed pump over a mile away. The job was planned with water conservation in mind. Reuse of the water from the facility's water treatment plant's discharge overcame the need to get permits to use water from an adjacent lake. Also, to protect the lake, each pump has a spill container to provide protection during refueling of the pumps. 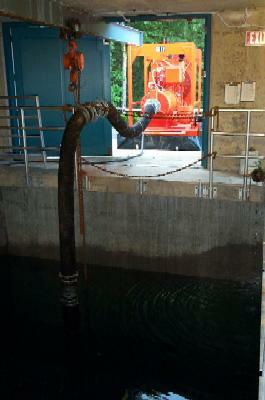 The job, which began in early July, will run through October when a permanent pump station is expected to come on line. The job was designed on site on a Friday, then delivered the following Monday. Within the week, the job was operational. Timing was important to keep the newly seeded grass growing and keep construction on schedule for the grand opening of the course.